Many garden plants we’re familiar with today have a hidden history. Grown centuries ago for their reputed healing powers, they became garden staples, valued for their beauty, form or scent. Pulmonaria, with its spotted leaves, was thought to symbolise diseased lungs, and used for chest infections. And the mint now found in a pot by the door was recommended to “stayeth bleeding” by early herbalists and apothecaries. There’s more to garden plants than just their aesthetics, says Fiona Davison, head of libraries and exhibitions at the Royal Horticultural Society, RHS. Plants generally don’t get into gardens by accident, she says – they have a long relationship with people. “It’s been a long story of people choosing particular plants, nurturing them, growing them, breeding them, making choices of which seedling they would select to carry on growing,” she says. 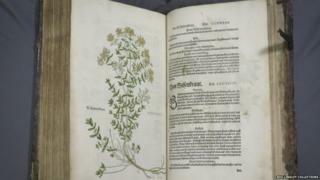 Studies of plants by ancient herbalists paved the way for the formal study of plants by the first botanists, many of whom were also physicians. Today, at least 28,000 plant species are recorded as being of medicinal use. Fiona Davison says the long story of the “healing garden” is coming full circle and we’re now thinking of gardens holistically as “healing spaces”, where, by spending time in them, we’re getting some well-being benefit. The yarrow plant is a herbaceous flowering perennial. The name comes from Achilles, because it was believed Achilles used it on the battlefield to staunch bleeding. Rosemary has long been recommended by herbalists for improving memory. According to English herbalist John Parkinson, the herb could remedy “all other cold diseases of the head and braines, as the giddiness or swimming therein, drowsiness or dulnesse of the minde and senses like a stupidnesse”. Valerian was recommended for sickness, pain and insomnia by many early herbalists. Nicholas Culpeper recommended both herb and root, for cough and plague. Honeysuckle was once recommended for skin problems and to “cleanse the face and skinne from morphew, sunburne, freckles, and other discolouring”. The roots of this plant has historically been used to treat a variety of ailments, including pains in the belly, bladder and kidneys. They were recommended for children with epilepsy, with the roots “either taken inwardly, or hung about their necks”. An exhibition on the healing garden can be seen at RHS Garden Wisley; RHS Garden Harlow Carr, Yorkshire; RHS Garden Hyde Hall, Essex; and RHS Garden Rosemoor, Devon until 4 March. All images: RHS Lindley Collections.